Driven by our passion for food, we shared an ambition to create a satisfying new quick-service experience. We have all eaten a lot of sad pizza, cold paninis and terrible salads. So, we start by questioning ourselves: What goes into a great dough? What makes you eat that last slice of pizza? What’s the wow factor in a panini? Why is pizza by the slice such a letdown? We came to the conclusion that grilled paninis are underwhelming. Worse, the bread can be hard, offering no satisfaction in the middle of a busy day. But what if the panini bread is baked fresh and not grilled? It was a radical reimagining of the panini process. Instead of a grilled panini or just toasting the bread, we imagined a panini baked fresh to order, featuring a tender bread with a flocculent interior, a buttery flavour and a lustry texture. Behold, Pannizza’s unique baked panini! Customers choose their ingredients on the spot, or select from the signature choices, and in under 3 minutes their paninis are baked fresh to perfection. Warm from the oven, they’re a satisfying sandwich experience with the gratification of freshly baked bread. We came to another conclusion. Pizza by the slice wasn’t cutting it. We refused to serve pre-made pizzas sitting under a heat lamp. Everyone deserves better. 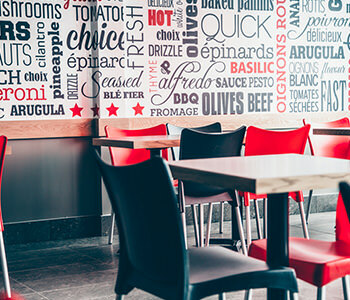 Traditional pizza parlours will bake you a pie, but the wait time can be a deal breaker. 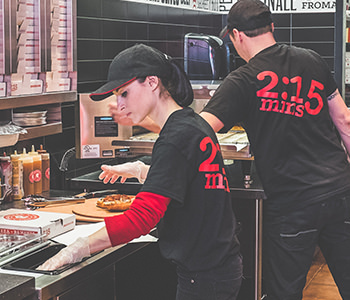 The idea is to offer a fresh baked pizza to order with a quick turnaround time. But how? After throwing around several ideas, the eureka moment arrived. We devised a way to hasten the prep time, using a century old recipe for Tender Stone Baked dough. We discovered a method that allows their personalized pizzas to be baked in just over 2 minutes. Voilà! No more long waits, no more old slices, instead customers choose their own toppings to put on a variety of crusts or select from the best-selling signature combinations.